T-Mobile and Motorola weren't too forthcoming with a US launch date for the CLIQ, given only a ballpark estimate of "holiday." However, this supposed carrier roadmap pinpoints a November release for the social-equipped Android handset. 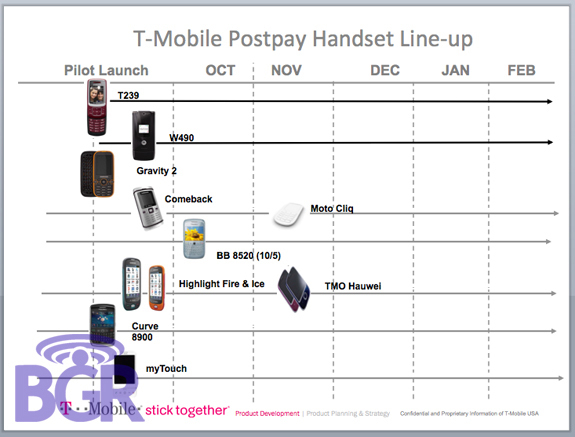 No clue how long ago this slide was made or how valid the information is -- note the placeholder image and non-capitalized title -- but we can't imagine T-Mo would wait too close to Christmas to unleash it on the willing masses. Mum's still the word on price, but that previous $0.00 figure is probably too good to be true. Update: Boy Genius has clarified that the source who gave him this chart is claiming it to be an outdated roadmap, and that a newer, not yet seen one shows it for October. Guess we'll find out soon enough. Motorola CLIQ's November launch revealed in T-Mobile roadmap leak? (Update: new info points to October) originally appeared on Engadget Mobile on Sat, 12 Sep 2009 15:56:00 EST. Please see our terms for use of feeds.